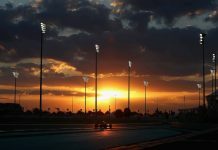 The home hero won his forty-seventh Grand Prix emphatically from the Red Bull of Max Verstappen, who himself was mighty, and team-mate Nico Rosberg who finished a distant third thanks to a post-race penalty. Hamilton was in sublime form on Saturday during qualifying. Not even a deleted lap could stop him from grabbing his fifty-fifth pole position; Lewis now just ten short of hero Ayrton Senna. The roar as Hamilton crossed the line left goosebumps on the arms of many. The crowd in numbers not seen since the Mansell Mania days of the early 1990s. Rosberg was some three tenths behind. 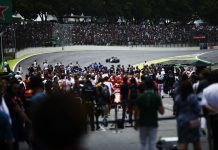 A neutralised start helped Hamilton enormously – he easily pulled away from Rosberg as the racing got going eventually. There was the odd scare though, as glazed brakes meant he nearly creamed into the back of the tin-top Mercedes safety car. Later in the race Hamilton also lost control coming into a damp Copse corner. A beautiful catch, and the chasing Verstappen making the exact same mistake, saved his blushes. In the end Hamilton was never troubled at the head of the field and he only lost the lead briefly during the first set of stops. It was the kind of win one could rather daftly call easy. Winning in front of your home crowd, under that kind of pressure, is never an easy task. It’s worth also noting the effort Hamilton put in off track this weekend on enganging with his fans. He spent a very long time on Saturday evening speaking to them and signing their memorabilia. On a weekend where everyone wanted a piece of him, he made sure the fans who had splashed out to watch him race were well looked after. It’s hard to believe that two races ago, Hamilton was twenty-four points behind Rosberg in the title battle. He leaves Silverstone tonight just ONE point behind his team-mate. So well done Lewis, that’s home win number four and two TOP DOG awards in the bag for 2016.